The micelles of this lightly foaming cleansing care water, capture all traces of makeup and impurities, guaranteeing a thorough but gentle cleansing of the face and eye area. Rose, Orange flower and Calendula flower, associated with Fucose and Aloe Vera, for a skin that is purified, softened, moisturised, toned and protected. Fresh radiant skin in a single step. Apply several drops to a cotton pad to cleanse the face and eye areas. Gently foaming, it can be rinsed off after application or not, according to your preference. 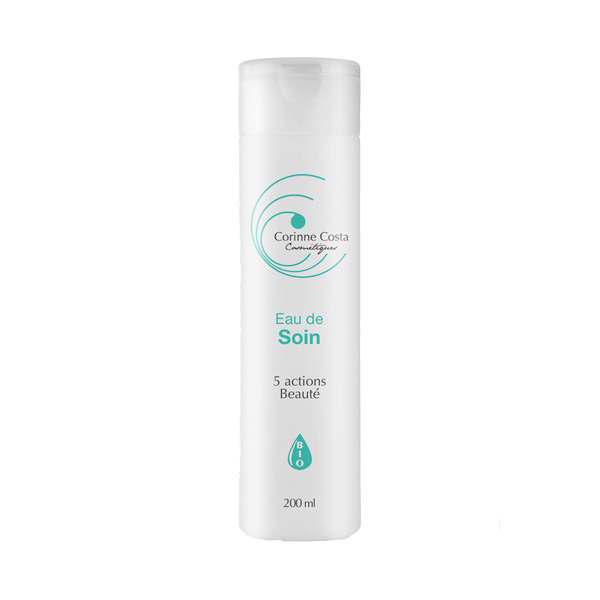 – Cleansing: the micelles of this lightly foaming eau de soin, capture all traces of makeup and impurities, guaranteeing a thorough but gentle cleansing of the face and eye area. – Soothing: Calendula water combined with a sugar, Fucose (a patented, scientifically documented active ingredient) for its soothing properties, helps prevent any feeling of skin irritation. Relieved and soothed the skin will better withstand the aggressive everyday attacks of environmental factors such as pollution. – Moisturising: The precious polysaccharides of the Aloe Vera retain water within the skin tissues, keeping the skin hydrated and soft; it also helps to reinforce the skin’s protective barrier. – Toning : Rose and Orange flower floral waters offer the skin their freshness and elegant floral scent together with a light toning action. – Anti-ageing: by stimulating the synthesis of sirtuin-1 in the skin, veritable “longevity proteins” for the cells, Fucose contributes to longer cell life, to delaying the signs of ageing and to maintaining a visibly “younger” skin. Fucose( Fucocel®) : has immediate and long lasting hydrating, moisturizing, anti-ageing and restructurantes properties which are associated by a remarkable sensory power. Organic Rose floral water: the beauty water “par excellence” for softer skin and reduced wrinkles. Astringent and toning, this is an essential hydrosol to prevent and combat skin ageing. It purifies, freshens and softens the skin and is also known to soothe irritated skin and redness.